Air compressors have numerous uses, from inflating tires to powering complex industrial machinery. An industrial air compressor may serve any number of purposes, but once you discover the need for a compressor, you must decide if you need a permanent system or a temporary solution. For many business owners, the choice comes down to either investing in an air compressor or renting a unit as needed. In this blog, we discuss the questions that can help you determine which of these options works better for your business. Can You Consistently Maintain a Compressor? As with any other type of commercial or industrial machinery, air compression systems need routine maintenance. This principle holds particularly true for integrated, permanent systems that are part of a work building. Before purchasing and installing an air compressor, you should ensure that you have the ability to properly care for the equipment. You may need to provide your employees with specialized training, designate a portion of your budget for upkeep, and so on. If you cannot consistently maintain a compression system as part of your facility, renting a unit with service provided by the rental company may be more cost effective. Does the Compressor Serve Multiple Purposes? Rental air compressors are ideal for a single purpose. For example, if you plan to do a one time large-scale painting of your facility with pneumatic spray guns, you needn’t buy your own compressor. However, if you find yourself thinking of more and more ways that you could use an air compressor on your premises, a rental period may not offer the time and flexibility you need to take full advantage of the unit. Do Portable Units Have the Capacity You Need? Air compressors come with widely varying capacities. For example, the types of compressors marketed to homeowners would not have enough air pressure for most industrial applications. Similarly, rental air compressors sometimes have limited capabilities. Because these units must be mobile and smaller than some of their permanent counterparts, a rental may not offer the capacity you need. In these cases, you may want to discuss your plans for the compressor with an experienced supplier. This expert can help you determine the right capacity for your applications so that you can make a more efficient and cost-effective decision. Do You Have Space to House the Unit? While rental units can come in sizes small enough for a single person to move, many permanent compressors are larger. For example, an integrated system may take up a large portion of a room or require its own enclosure for safe use. If you do not have the space for a permanent unit, a rental may be your best solution short of expanding your business property or moving to a different location. Do You Want to Test Several Compressors Before Investing? Different types of air compression work better for different applications. How the machinery compresses air determines whether the unit works well for a particular task. For example, rotary screw compressors can deliver high volumes of compressed air quickly, which makes these units ideal for powering heavy duty equipment like jackhammers. A compression professional can give you an idea of which unit types would be best for your application. Rental units give you the flexibility to try multiple air compressor types before committing to a large investment. The cost of installing and removing rental units needs to be considered in the evaluation. Sometimes deciding between buying or renting an air compression unit is as simple as thinking about how long you’ll need the unit and how often you would use it. If you know you’ll only use the air compressor for a single project, renting is the way to go. However, if you anticipate frequently needing compressed air or needing the use of a compressor for months at a time, a unit of your own may be the best choice. Considering your timeline enables you to make the most cost-effective decision. Purchasing a new compressor for one job could be a waste of money, while renting a unit for the required tasks can reduce the amount you spend getting the compression you need. Conversely, perpetual rentals could end up costing you more than the one-time expense of buying your own unit in the long run. If you aren’t sure how long you’ll need the unit for, it may be smart to start with a rental. This decision allows you to return the air compressor if you discover that you no longer need it. Use your answers to each of these questions to decide the best way to get the pneumatic tool you need for your business applications. 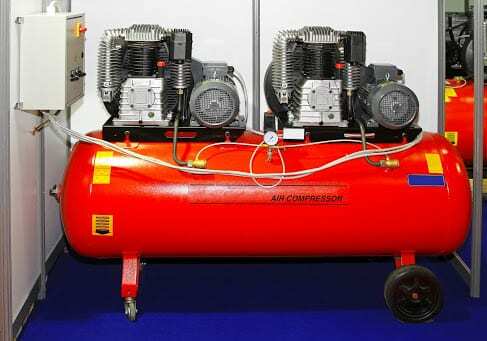 At Compressor-Pump & Service, Inc. we offer air compressors of most types for either renting or investing. Discuss your options with a knowledgeable member of our staff to determine if a temporary rental period or a long-term investment works better for your business.